How To Keep Your Cat Calm During A Ride? 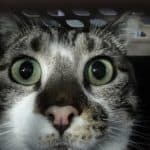 Cats poop or pee in the carrier whenever they are nervous or scared. Cats generally don’t like being in a carrier. Carrier is a foreign place to them which is outside their comfort zone. So, whenever you are carrying your cat inside a carrier, it is normal for her to be nervous. Each cat deals with nervousness differently. Some deal badly and poop/pee inside the carrier. So, you must be wondering what is the solution to this problem? 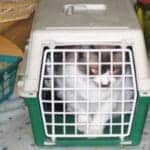 First, you need to make sure the cat is as much stress-free as possible in the carrier. Nervousness is the main reason for cats to do their business inside a carrier. So, keep your main focus in making your cat calm. Make the carrier comfortable for your cat. Feed your cat 5-6 hours before the journey. After that, do not feed her anything. It will keep the bowel less heavy. Keep the water intake minimum which will reduce the chance of accidental peeing. As I have said earlier, to make your cat stop pooping in her carrier, the first thing you need to focus on is making her as much calm as possible. First, you need to make the carrier a familiar place for your cat. The cat needs to associate the carrier as a place that she knows. She needs to feel comfortable inside the carrier. Before even starting the journey, you’ll need to know how to put a cat in a carrier. Put your cat’s favorite toys inside the carrier so that she doesn’t get bored. Keep her favorite treats at hand to make her calm if necessary. Put a blanket inside the carrier that has your cat’s smell on it. It is better to use the blanket your cat uses for sleeping every night. If the ride is long, make frequent stops and let your cat out of the carrier (obviously use a harness or leash). Talk to your cat, pet her and let your voice soothe her. This is very effective for keeping your cat calm. Some cats are much more difficult to deal with. For those cats, it is better to use a bottle of cat pheromone. Just spray some pheromone inside the carrier. This works magic for keeping a carrier calm. 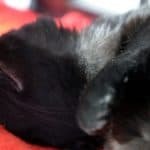 These solutions will cost you a little bit of money, but these will guarantee that your cat won’t make a mess inside the carrier. There are now carriers in the market that comes with a litter box. These can be a great solution if your cat keeps on pooping inside the carrier. Though the thing I do is a bit different. I don’t by any carrier that comes with a built-in litter box. Because this type of carriers offers very poor quality. Instead, I bought this carrier. It has a lot of space inside where I can place an additional litter box along with my carrier. The most important thing is, this carrier offers the optimum quality that I always look for in a carrier. It provides security, ventilation as well as high-portability. All of these matters most to me when I am traveling with my cat in a carrier. Cat diapers can be a cheaper yet effective solution to this problem. You don’t need to spend as much money as you need to buy a carrier. However, you’ll have to deal with the diapers. Personally, I think spending a few more bucks and getting a decent spacious carrier is far better. 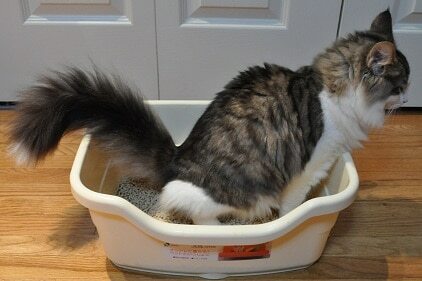 I hope after following these solutions, you won’t have to deal with cat pooping in her carrier anymore! Let me know how these solutions worked out for you in the comment box below!